Despite major developments in the management of septic shock, the mortality rate had progressively increased. Ibuprofen has been shown to have beneficial physiological effects when used as a treatment. However, there are conflicting results with respect to survival. This study aims to investigate the effect of ibuprofen on vital functions, various physiological parameters and survival during endotoxic shock in rabbits. Twenty-eight New Zealand rabbits were randomly separated into four groups. The first group received only saline, the second was given 2 mg/kg intravenous endotoxin at t0, the third received 30 mg/kg ibuprofen 30 minutes after endotoxin administration, whilst the fourth group received ibuprofen 30 minutes before the endotoxin. Respiratory and heart rate, mean arterial blood pressure and rectal temperature were recorded. Complete blood counts were performed and thromboxane B2 was measured every 30 minutes for the first two hours, and then hourly over the course of the experiment. Urine samples were collected at the same time points for the measurement of prostaglandin E2. Ibuprofen was found to improve respiratory rate, heart rate, and arterial pressure. However, it did not improve the negative effects of endotoxin on body temperature, haematocrit values, white blood cell count, and thrombocyte number. Thromboxane B2 levels in group IV were significantly lower than in the other groups, and the increase started at a later timepoint. In ibuprofen-treated animals, Prostaglandin E2 levels stayed low for at least 90 minutes, but started to rise thereafter. While the average survival in Group II animals was 192.9 ± 46.9 minutes, those of groups III and IV were 339.1 ± 33.5 minutes (p < 0.05) and 383.0 ± 39.6 minutes (p = 0.01), respectively. Ibuprofen appears to increase survival in endotoxic shock-induced animals. Therefore, it may be helpful for the prophylaxis and treatment of patients with, or who are likely to develop, septic shock. Although there have been major developments in its diagnosis and treatment, the mortality rate of septic shock has progressively increased over the past few decades. The mortality rate can be as high as 60–70% in cases with multi-organ failure , and several pharmacological agents have been used in an effort to reduce this percentage . In endotoxic shock, bacterial endotoxin enters the systemic circulation and triggers the release of pro-inflammatory mediators. Prostaglandin is released during inflammatory reactions, causing an increase in microvascular hydrostatic pressure, which is a primary cause of edema and a contributory factor in hypovolemia [3, 4]. Non-steroidal anti-inflammatory agents (NSAIDs), such as acetyl salicylic acid and indometasin, have been used in the treatment of sepsis and septic shock, and an improvement in survival has been noted. Several researchers have also evaluated ibuprofen, and beneficial effects on pathophysiological changes have been observed . The first major study of ibuprofen in endotoxic shock was performed by Jacobs et al.. This study indicated that ibuprofen can limit the degree of hypotension and acidosis, and decrease the cardiac index in endotoxic shock. Fink et al. reported that ibuprofen restored the normal hemodynamic pattern. However, Hulton et al. saw no major metabolic effect in E. coli sepsis. Coran et al. showed that the administration of ibuprofen in septic shock in dogs did not reduce cytokine levels. Herbertson et al. showed that ibuprofen administration in endotoxic shock in pigs could prevent the early hemodynamic changes following entotoxemia, but not the later changes. Bernard et al. reported that, in patients with sepsis, treatment with ibuprofen reduced levels of prostacylin and thromboxane and decreased fever, tachycardia, oxygen consumption, and lactic acidosis, but did not prevent the development of shock or acute respiratory distress syndrome, and did not improve survival. Despite several studies using ibuprofen in endotoxic and septic shock models, there are some conflicting results with respect to survival, and there are few studies using pre-treatment with ibuprofen. In this study, we investigated the effects of ibuprofen on physiological parameters and survival in pre- and post-treated rabbits with experimentally induced endotoxic shock. Twenty-eight New Zealand rabbits were anaesthetized by intramuscular (I.M.) injection with 35 mg/kg ketamin hydrochloride (Ketalar ampul, 50 g/ml, Eczacibasi Drug Company, Istanbul, Turkey) and 5 mg/kg xylasine hydrochloride (Rompun ampul, 23.32 mg/ml, Bayer, Istanbul, Turkey). Anesthesia was maintained with additional doses of ketamin and xylasine. 24 G canulas were inserted in to the right femoral artery and vein and monitored with a Siemens SC 6000 monitor (Danvers, MA, USA). The rabbits were randomly divided into four groups of seven animals. In Group I (control), 1 mL isotonic saline was given by intravenous infusion and 1 mL blood samples (to obtain basal vital measurements and biochemical parameters) were taken simultaneously at 0, 30, 60, 90, 120, 180, and 240 minutes. 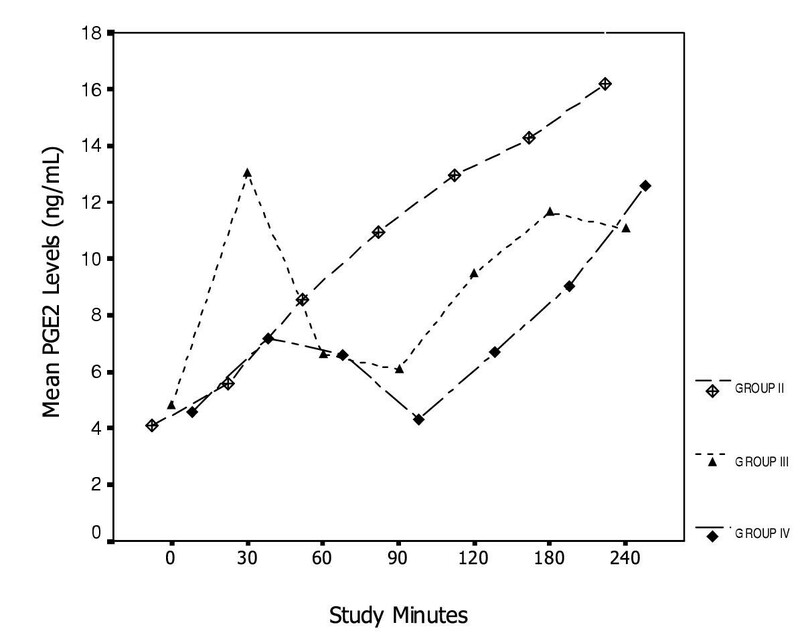 The rabbits in Groups II, III and IV (study groups) received 1 mL sterile saline at 30 minute intervals for 120 minutes, after which the sampling and injection frequency was increased to every 60 minutes. Sterile saline was given to Group I for the duration of the experiment, including at t0. Group II received 2 mg/kg endotoxin (Escherichia coli O55:B5, Sigma Chemical Company, USA) in sterile physiological saline (0.5 mL/kg) at t0. Sodium salt of ibuprofen (Sigma Chemical Company, USA) was dissolved in sterile saline at 77°C in a hot water bath. It was cooled down to 35–37°C, then injected into Groups III and IV by slow infusion at a dose of 30 mg/kg/5 mL at +30 and -30 minutes, respectively. Rabbits in the first group were followed for 240 minutes, and those in the remaining groups were followed until they died. Complete blood counts (CBC) were measured with an S+Coulter Counter (Fullerton, CA, USA). Blood samples for measuring Thromboxane B2 (TxB2) levels were collected in EDTA-tubes, centrifuged at 2000 rpm for 20 minutes, and immediately stored at -20°C. Urine samples were collected for Prostaglandin E2 (PGE2) measurements by suprapubic aspiration, which completely emptied the bladder. The urine samples were immediately stored at -20°C. TxB2 and PGE2 were determined by radioimmunoassay according to the manufacturer's protocol (Amersham Pharmacia Biotech Ltd, UK) using the Amerlex-M Magnetic Separation System at the Department of Biochemistry, College of Medicine, Istanbul University. Rectal temperatures were taken with a thermometer. All data are presented as mean ± SEM. Parameters were compared over the study period using analysis of variance for repeated measures (SPSS version 10.01 for Windows). Where the F values were found to be significant, data were compared with Tukey's b test. Comparisons between the four groups at the same time point were analyzed by one-way analysis of variance followed by Tukey's-b post hoc test, where appropriate. P < 0.05 was considered statistically significant. Respiratory rate, heart rate, mean arterial blood pressure (MAP), body temperature, leukocyte and platelet counts, haematocrit levels, plasma TxB2 and urine PGE2 levels in all groups are discussed below. None of the rabbits in Group I died after the experiment. The letter 'N' in Tables 1,2,3 indicates the number of rabbits that survived endotoxin administration in the study groups. This was significantly increased over 30, 60, 90 and 120 minutes in group II (p < 0.001). In comparison, it was high at 30 minutes, but returned to t0 levels after 60 min in group III rabbits. The respiratory rate in Group IV was increased compared to the control group (Group I), but this difference was not statistically significant (p > 0.05). This parameter in both Groups III and IV was lower than in Group II (p < 0.001). There was no significant difference in respiratory rate between Groups III and IV (p > 0.05, Table 1 and Fig. 1). Mean respiratory rate values change over time for all groups. In both Groups III and IV, respiratory rates were lower than in Group II (p < 0.001). No significant difference was seen between Groups III and IV (p > 0.05). In Group II rabbits, which received endotoxin, heart rates significantly increased between 30 and 90 minutes, compared to t0 (p < 0.001). Group III received endotoxin and ibuprofen at 0 and 30 minutes, respectively. In this group, heart rates were found to be increased at 30 and 60 minutes compared to t0 (p > 0.05). In this group, only one rabbit survived after 420 minutes. Ibuprofen was administered to Group IV at 30 min and endotoxin at t0. An increase in heart rate was observed at 60 minutes, but this was not statistically significant (p > 0.05). When all groups were compared, heart rates at 60 min in both Groups II and III were significantly higher than in Group I (p < 0.05). Heart rates in Group IV were not significantly different from the control group (p > 0.05), but were significantly lower than both Groups II and III (p < 0.01, Table 2 and Fig. 2). Mean Heart rate values change over the time for all groups. In groups II and III, heart rates at 60 min were significantly higher than in Group I (p < 0.05). In Group IV they were not significantly different from controls (p > 0.05), but lower than II and III (p < 0.01). 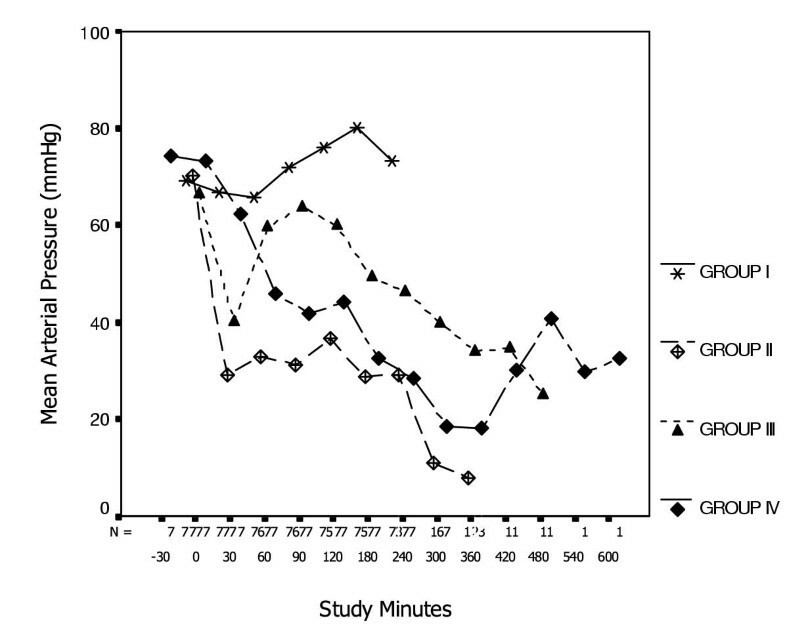 MAP levels showed an obvious decrease at 30 minutes in group II, which received only endotoxin from t0. MAP levels gradually decreased in group III, but showed a more regular gradual decrease in group IV. When MAP levels between the groups were compared, it was observed that groups II and III had statistically significant decreases compared to groups I and IV (p < 0.0001) at 30 minutes. Although MAP values decreased in group IV, there was an obvious difference between groups IV and I (p > 0.05). At 60 minutes, MAP levels started to decrease in group IV, and were statistically different from groups III and I (p < 0.01). At 90 minutes, MAP levels in groups II and IV remained statistically different from groups I and III (p < 0.01). At 120 minutes, they started to decrease in group III and statistically clear differences from group I (p < 0.05) could be seen. Arterial pressure in group III was found to be statistically higher than in both groups II and IV (p < 0.02). At 180 and 240 minutes, MAP levels kept decreasing in groups II, III and IV. They were clearly lower in those three groups than in group I (p < 0.001, Table 3 and Fig. 3). Mean arterial blood pressure changes over time for each group. At 60 minutes, MAP levels started to decrease in group IV, and were statistically different from groups III and I (p < 0.01). At 90 minutes, MAP levels in groups II and IV remained statistically different from groups I and III (p < 0.01). At 120 minutes, they started to decrease in group III and statistically clear differences from group I (p < 0.05) could be seen. Arterial pressure in group III was found to be statistically higher than in both groups II and IV (p < 0.02). At 180 and 240 minutes, MAP levels kept decreasing in groups II, III and IV. They were clearly lower in those three groups than in group I (p < 0.001). 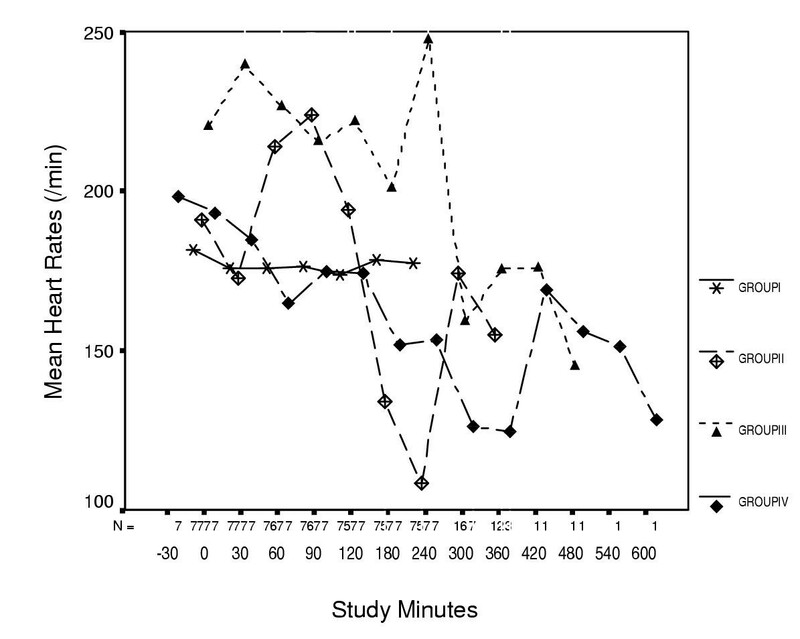 In general, there was no statistically significant difference in body temperature between the study groups, but there was a significant difference between Group I and the study groups (p < 0.001). In addition, hypothermia developed after endotoxin administration. There were fewer white blood cells in the study groups than in the control group, and the difference was statistically significant (p < 0.0001). There was no significant difference in white blood cell counts between the endotoxin- and ibuprofen-treated groups. The number of platelets decreased after endotoxin administration, but ibuprofen had no effect on the platelet counts. These began to decrease gradually after 90 min in group II, and after 180 min in group III (when they were significantly lower than the onset levels). In group IV there were no statistically significant changes in haematocrit values throughout the study. These increased following administration of endotoxin at t0 in Group II. Significant decreases in TxB2 levels were detected in Group III from 60 to 240 min, after injection of ibuprofen at 30 min. Highly significant differences were observed between the t0 and 240 min samples (p < 0.001). In Group IV, plasma TxB2 levels were lowest between -30 minutes and t0 (there was no significant difference between them). Plasma TxB2levels began to increase after 30 minutes, which was significantly different from the -30 minute and t0 values (p < 0.005 and p < 0.01, respectively). When plasma TxB2 levels were compared between all groups, t0 values were not significantly different between Groups II and III (p > 0.05), but they were significantly lower in Group IV than in any of the other groups (p < 0.006). At 60 minutes, plasma TxB2 levels were reduced in both Groups II and III, but were increased in Group IV. They were significantly different between Groups II and III and the control group, but no significant differences were detected between study groups (p > 0.05, Table 4 and Fig. 4). These increased transiently after 30 minutes in Group II, and the increase at 60 min was significantly different from the 90 min sample. 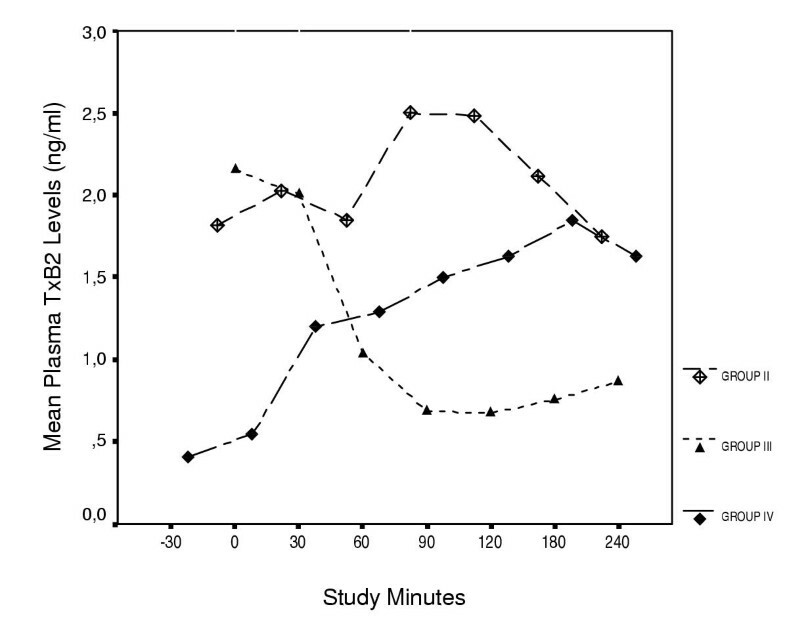 In Group III, urine PGE2 levels were significantly increased at 30 min compared with t0 (p < 0.001). However, they declined after 60 minutes. This decline continued to the 90 minute sample, so that PGE2 levels at both 60 and 90 min were significantly lower than the 30 minute value (p < 0.001), but no different from t0 (p > 0.05). In Group IV, PGE2 levels increased at 30 min compared to t0, after administration of endotoxin. They then began to decrease from 60 and 120 min, but the difference was only significant between 30 and 90 min (p < 0.025, Table 5 and Fig. 5). Mean Urine PGE 2 values over time for all groups. 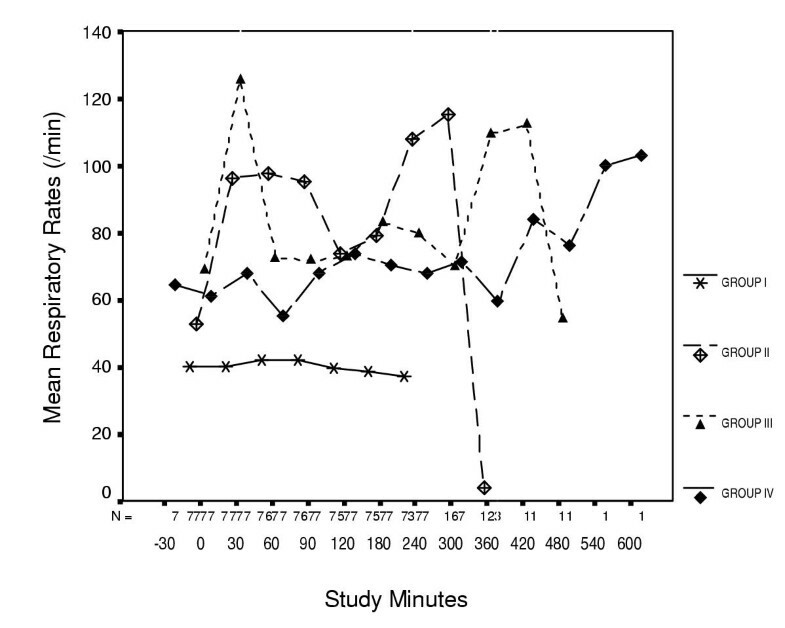 In Group III, urine PGE2 levels were significantly increased at 30 min compared with t0 (p < 0.001). They declined after 60 minutes and continued to decline at 90 minutes; levels at both 60 and 90 min were significantly lower than the 30 minute value (p < 0.001), but no different from t0 (p > 0.05). In Group IV, PGE2 levels increased at 30 min compared to t0, then began to decrease from 60 and 120 min, but the difference was only significant between 30 and 90 min (p < 0.05). Among the three endotoxic shock groups, the longest mean survival time was observed in Group IV (383.0 ± 39.0 minutes). The survival rate in Group IV was significantly higher than in Group II (192.9 ± 46.9 minutes), but not significantly higher than Group III (339.1 ± 33.5 minutes) (p > 0.05). In Group III, mean survival time was also significantly higher than in Group II (p < 0.05). Mean survival times are shown in Fig. 6. Mean Survival times over time for all groups. In Group IV survival rate was significantly higher than in Group II, but not higher than Group III (p > 0.05). In Group III, mean survival time was also higher than in Group II (p < 0.05). Ibuprofen is a reversible, short-acting cyclooxygenase inhibitor, which particularly blocks the synthesis of thromboxane. Under in vitro conditions, it has been shown that ibuprofen stabilizes lyszomal membranes, restrains the secretion of lysozomal enzymes from granulocytes, and prevents the aggregation of platelets as well as the immigration of leukocytes [1–5]. NSAIDs were first used by Northover and Subramanian  in an endotoxic shock model in dogs, in order to improve hemodynamic disorders. In endotoxic or septic shock models, respiration pathway changes occur in the lungs. Metabolites of cyclooxygenase play an important role in this. Studies done with ARDS patients have shown that there is an increase in the number of PMNs in the lung and bronco-alveolar fluid, which cause an increase in elastase and other lysozomal enzymes . Kopolovic et al. have reported that respiration dysfunction and hypoxemia were improved and pulmonary hypertension decreased in pigs that were administered ibuprofen after Pseudomonas aeruginosa infusion. In addition, the same researchers reported that treatment with ibuprofen caused a decrease in pulmonary shunt and lung edema. Balk et al. used ibuprofen in a canine endotoxic shock model and found that it affected the extent of histological and morphometric lung injury. In this study, the respiratory rates of the study groups were significantly higher than the control group at 30 min. 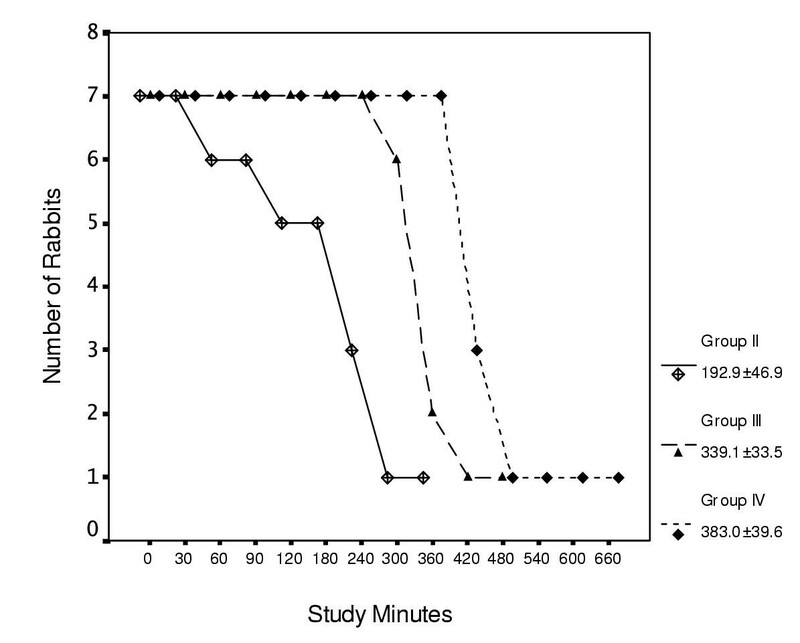 The respiration rates in both Groups III and IV were lower than in Group II right out to 360 minutes. Because the study groups (II, III, and IV) showed no remarkable differences after 360 min, we presume that ibuprofen is not effective after this time. In addition, ibuprofen administration can prevent hyperpnoea if given before endotoxin. Endotoxin administration may lead to hypotension and tachycardia . In one study, Suffredini et al. administered endotoxin to healthy volunteers and observed an increase in cardiac output of 53%, a decrease in systemic vascular pressure of 46% and an increase in heart rate of 36%. Previously, it has been observed that ibuprofen administration in endotoxic shock models prevents an increase in heart rate due to metabolic changes or regulation of oxygen dispersal at the tissue level [16, 17]. In addition, another study by Revhaug et al. reported that ibuprofen administration before endotoxin prevented an increase in heart rate. Yamanaka et al. reported that there were no significant differences from the heart rates of controls in a similar study. In our study, it was observed that pre-treatment with ibuprofen prevented heart rate increase. The effects of ibuprofen started at 90 min and lasted up to 180 min in the group that received ibuprofen after endotoxin. Thus, it appears that ibuprofen has no effect on secreted cyclooxygenase products, as it inhibits the cyclooxygenase enzyme. With this inhibition, new production of cyclooxygenase products is blocked. Therefore, the cyclooxygenase secreted by Group III caused tachycardia, but new formation of cyclooxygenase was inhibited by ibuprofen administration, so tachycardia was resolved. Therefore, it seems that ibuprofen administration has little effect on respiratory rate and heart rate. Beck and Abel  reported that administration of ibuprofen before endotoxin blocked the sudden drop in mean arterial pressure in experimentally-induced endotoxic shock in dogs. Coran et al. reported that mean arterial pressure was significantly higher in animals that received ibuprofen before induced shock than the control group in their experimental canine septic shock model. They indicated that MAP was consistently about 90% of the initial arterial pressure level. They also reported that when animals received ibuprofen after endotoxin; arterial pressure initially fell to about 50%, then increased gradually and continued to be about 70% of initial levels. In the present study, there was a general reduction in mean arterial blood pressure in group II, which received endotoxin. On the other hand, there was a sudden drop in MAP in Group IV, which received ibuprofen before endotoxin, whereas an increase in MAP was seen at 60 minutes in the group that received ibuprofen after endotoxin. However, since initial MAP levels were not established in the study groups, it is possible that some other mediators were affecting blood pressure at the start of the experiment. Ebong et al. reported that all mice developed hypothermia in their model, where septic shock was induced by caecal ligation. While body temperature was above 34°C on day 1, it later decreased below 34°C. Haupt et al. observed that fever in severe septic shock patients' was reduced after ibuprofen administration. However, they did not see a reduction in PGE2 levels, so they assumed that the reduction in fever was due to ibuprofen causing a decrease in IL-1 and TNF secretion, or due to the direct effect of ibuprofen on the central nervous system. The anti-pyretic effect of ibuprofen started at 4 hours, and lasted up to 24 hours after infusion. The role of cytokines in hypothermia is not yet known, however, it is thought that the decrease in body temperature is dependent on a decrease in pyrojenic cytokines. During hypothermic sepsis, the response of cytokines and eicosanoids is higher than in febrile patients. Therefore, ibuprofen has been considered to be more useful in hypothermic patients than in septic shock patients . In our study, changes in body temperature among study groups were not statistically significant. The numbers of white blood cells are reduced in experimental animals induced with endotoxic shock . Griffin et al. reported that the number of white blood cells decreased after endotoxin administration in pigs. In addition, they found significant differences between endotoxin and endotoxin plus ibuprofen administration. In our study groups, the numbers of white blood cells were significantly lower than in the controls (p < 0.0001). There were, however, no significant differences in the white blood cell counts between endotoxin and ibuprofen treated groups. Haematocrit values appear to increase in some endotoxic shock models, but decrease in others [10, 19, 20, 22]. It has been reported that ibuprofen has no effect on the consumption of systemic complement, thrombocytopenia, leucocytosis or leucopenia . In our study, there was no increase in haematocrit levels. This may be related to the fact that 30–35 mL of blood was withdrawn from each rabbit. Ibuprofen also appeared to have no effect on haematocrit levels in our study. The occurrence of isolated thrombocytopenia is higher than 50% in septic shock patients without disseminated intravascular coagulation . The endotoxic shock experimentally induced by Griffin et al. in pigs showed that the numbers of platelets decreased after endotoxin administration, but no significant differences were again seen between endotoxin and endotoxin plus ibuprofen (p > 0.05). In our study, it was also observed that the number of platelets decreased after endotoxin administration, whilst ibuprofen had no effect. Many studies have shown that endotoxin administration can result in an acute decrease in the white blood cell count [4, 12], but we propose that ibuprofen has no effect on leukocyte and platelet counts. It has been indicated that the pathway of cyclooxygenase products, such as TxB2 and PGE2, increases in many endotoxic shock models and plays an important role in a number of pathophysiological events [21, 27]. TxA2 is a product of arachidonic acid and a potent platelet aggregator, whose levels increase during endotoxic shock. Ibuprofen prevents the formation of TxA2, as well as platelet and leucocyte aggregation [12, 21]. Fletcher et al. reported that the levels of TxB2 were significantly reduced in rats by a combination of TNF and ibuprofen. Plasma TxB2 levels were also reduced by introducing ibuprofen into the faecal peritonitis rat model used by Wise et al.. In this study, TxB2 levels decreased in the ibuprofen post-treated group compared with initial onset levels. In addition, it was found that the onset levels of TxB2 were significantly lower in the pre-treated group than the other groups. Making incisions into the rabbits may have caused an increase in pro-inflammatory cytokines. Low levels of TxB2 in group IV (at 0–30 min) were probably a result of ibuprofen inhibiting the increase which would normally be caused by these cytokines. The endotoxic shock mouse model reported by Rosello et al. showed that the levels of PGE2 were significantly lower in the ibuprofen-treated group than in controls. However, the levels of urine PGE2 were higher at 12 hours in both treated and untreated animals, but the difference was not statistically significant. In our study, it was observed that urine PGE2 gradually increased in group II after endotoxin administration. After treatment with ibuprofen, urine PGE2 levels decreased over the next 90 min, but later began to rise again. In another version of this study published previously, it was seen that ibuprofen reduced the endothelin production induced by endotoxin administration . Griffin et al. reported that there was no difference in mean survival times between control and ibuprofen pre- and post-treated groups. Arons et al. performed a study with hypothermic septic patients, and reported that ibuprofen could be used to decrease mortality rates. Schirmer et al. found a transient 24-hour survival benefit in a rat model of septic shock. Fletcher et al also reported that TNF-induced mortality could be reduced by using ibuprofen. Rosello et al. found survival rates increased in mice treated with ibuprofen. In addition, Young and Passmore  reported that ibuprofen-treated canines with induced endotoxic shock had longer survival times than those treated with propylgallate. However, Bernard et al. reported that there were no statistically significant differences between ibuprofen-treated and untreated animals with regards to their 30-day survival rate. In our study, mean survival time was significantly longer in the ibuprofen-treated groups compared with the untreated group. In addition, the pre-treated group had a longer mean survival time than the post-treated group, but it was not statistically significant. Ibuprofen appears to increase short-term survival due to its positive effect on various physiological parameters. Therefore, the use of ibuprofen at higher doses, over longer time periods, or in combination with other drugs in patients who are at risk of developing septic shock could be effective as a prophylaxis or treatment. It was presented as an oral session at ECMIDD 11, 01–04 April 2001, in Istanbul. This study was performed in the Department of Clinical Microbiology and Infectious Diseases, College of Medicine, Firat University, Elazig, and Department of Clinical Biochemistry, College of Medicine, Istanbul University, Istanbul, Turkey. This study was supported by Firat University Research Foundation.